Designed by the Fiat Style Centre, the new car’s originality is summed up by elegant, distinctive styling, with captivatingly smooth, simple, uncluttered lines that give the car a dynamic, harmonious look. 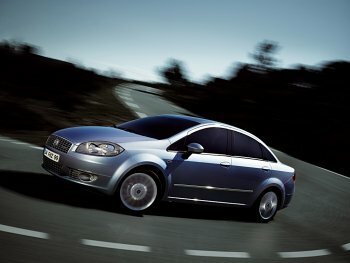 The Fiat Linea is also unmistakably Italian, which confirms the brand’s intention to create a new Fiat family feeling, inaugurated with the Grande Punto and continued with the Fiat Bravo, while the forward, sloping windscreen, the drop-shaped headlights and the large front end sporting the new Fiat logo constitute a new interpretation of the famous Italian GT tradition. Proposed with a single body type, the car conveys an impression of solidity, robustness and roominess, which is confirmed by the generous dimensions: it is 456 centimetres long, 173 cm wide and 150 cm tall, with a wheelbase of 260 cm, measurements that put it at the top of its category. The Fiat Linea has an imposing front end, almost worthy of a GT, but which respects pedestrian impact criteria. The result, in terms of composition and shape, is therefore the outcome of painstaking analysis, and respects the new standards, which envisage rounder volumes, a wider bonnet and a tapered bumper structure, which is perceptible above all in the plane view, to reduce the area involved in an impact as much as possible. What is more, the windscreen and the bonnet are accentuated and homogeneous: because there is no distinct break between them (pronounced bonnet and sharply raked windscreen), they appear to be the continuation of the same line, a characteristic that highlights the dynamism of the Fiat Linea. In line with the dictates of the new standards, the grille marks the dividing line between the bonnet and the front bumpers, and the latter taper off gradually until they meet the wheelarches. A ridge starts from the foglights, which link up to the sides, and incorporates them, linking up again at the centre with the lower air intake. And finally, a rib between the headlight and the foglight makes the bumper look lighter and creates the same graphical motif. The sleek, faired headlights which extend towards the sides of the car suggest dynamism and a strong Italian imprint (like the rear lights, they are made by Magneti Marelli - Automotive Lighting). On the side the styling is cut through by a ‘slash’ which starts from the middle of the wheelarch and dissolves into the rear, emphasising the car’s dynamic look. 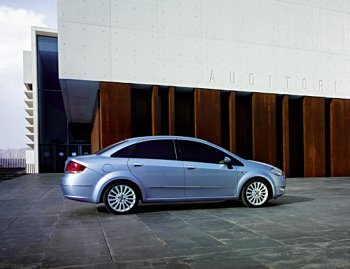 The emphatic, robust, muscular wheelarches give the Fiat Linea a feeling of strength and solidity. And the same reassuring impression is conveyed by the rear end, with its elegant uncluttered line.